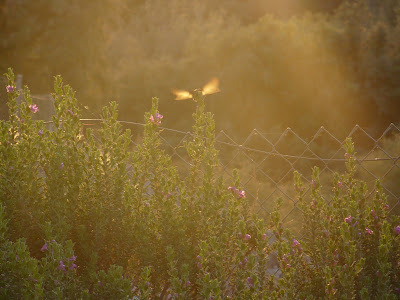 When important things like Ruby Throated Hummingbirds are flitting about the Mogollon Sage bushes I poached from the rim. Yes, I stole them. No, I am not ashamed. 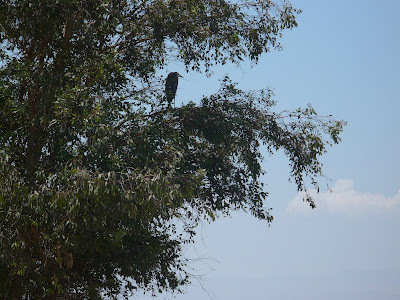 Then, when I went out again to water my herb pots, I saw this guy perched in a eucalyptus tree. That's a Great Blue Heron. They are frequent visitors here. I used the zoom feature on my camera, he was actually about 30 yards away, at the 2nd tee of the golf course. Obama made a great appearence on Meet The Press. I will watch a rebroadcast later today, unless of course, other, more important events like, birds, or children, demand my attention.